The Wisconsin Society for Ornithology has a Board of Directors composed of four officers and up to 20 directors. Members of the Board are elected for a term of one year, and may serve more than one term. The President and Vice President are limited to two terms each. All Board members serve on a volunteer basis and are not compensated for their contributions to the Society. Myles grew up in Durand and has lived his entire life in Wisconsin. He says he has always been drawn to the diversity the four seasons provide here. As a child, he was introduced to the enjoyment of nature from his dad and brothers by their participation in many outdoor activities like hunting, fishing and trapping. But it wasn't until he became interested in the pure enjoyment of just being surrounded by the beauty of nature and the peace and tranquility it brought him, that birding became his joy and passion. Besides bird watching, his other interests include, photography, golfing, and spending as much time as possible with his wife Sue and four sons (Zach, 29; Alex 25; Nicholas, 22; and Bailey 16). Myles works for Sentry Insurance in Stevens Point and has a B.S. in Business Administration from Cardinal Stritch University and an associate degree in computer science from Chippewa Valley Technical College. His current nemesis species is the Connecticut Warbler. Mary always knew that her heart belonged in nature. She grew up in the city, but now lives on a forty-acre bird-friendly hobby farm in southeast Wisconsin, with gardens, a native prairie, pastureland and a pond. Purity Farms was the perfect place to raise four kids with horses, a Jersey cow, chickens and a dog. Now that the kids have flown the coop, Mary dedicates much of her time to working for organizations that represent her passion for birds and nature. Prior to joining the board, Mary served on the boards of Wisconsin Public Radio and the Kettle Moraine Garden Club and on various committees in her local community. She joined the WSO Board as Chair of Development and served on the Conservation Committee. She has spent time advocating for issues of conservation and public broadcasting in Madison and Washington, D.C. Her degree in psychology has provided her insight into the benefits of nature for a healthy mind, body and spirit. Mary is honored to serve as Vice President of the WSO and hopes to share her admiration and excitement for this organization with members and the community at large. Jenny has lived her entire life in Wisconsin and has always been interested in nature. She has always enjoyed feeding backyard birds but was turned on to birding as a hobby by a warbler walk advertised by the Hoy Audubon Society of Racine and Kenosha in 2008. She quickly made lots of new friends on the walks and became hooked on birding. Jenny has been active in the Hoy Audubon Society ever since and has served on Hoy's Board of Directors as Treasurer, Newsletter Editor, Vice President and is the current President. She also enjoys attending WSO birding field trips. Jenny joined the WSO Board of Directors in 2012 as Secretary. Jenny and her husband David live in Caledonia (Racine County), monitor a 20-box bluebird trail at the South Hills Golf Course in Franksville, and vacation in Marinette County each summer. She has seen 317 species of birds in Wisconsin; her favorite is the Pileated Woodpecker. She's been on birding trips to Costa Rica and Southeast Arizona, and Peru. Besides birding, her other hobbies include gardening, hiking, canoeing, nature photography (including birds, of course) and playing with her two Dobermans, Loki and Maddie. Jenny is employed as an occupational therapist and certified hand therapist with Aurora Health Care. Dani Baumann was tricked into starting her birding career at 4:30 am on May 6th, 2011 in the middle of Wyalusing State Park while on a "No, we won't get up early" trip. Since that day her life has revolved around birds and numbers. Dani graduated in 2007 from UW-Milwaukee with a Bachelors in Business Administration - Accounting and is currently working as the accountant at PFlow Industries. A dedicated volunteer, when she isn't in her office, Dani can be found coordinating WBBA2 atlasing efforts in Ozaukee County, editing The Timberdoodle News (the newsletter of the Noel J. Cutright Bird Club), or participating on the board of directors of Sheboygan County Audubon Society. You may also recognize her name from "Let's Go Birding," a past feature in the Badger Birder. Amazingly, Dani also finds time to bird the wonderful hotspots of her home county of Ozaukee. Outside of birding, you can often find her reading a good book with her cat, Charlie, curled up in her lap. Dar Tiede is a lifelong resident of Wisconsin, born and raised in Appleton. He graduated from Miami (of Ohio) University with a BS in Applied Science and has a master's degree from the Institute of Paper Chemistry (formerly located in Appleton). He has worked in product development and research his entire working career and is looking forward to retirement in the near future. His wife (of 42 years!) Cathy and he have spent 23 years in Wisconsin Rapids where they raised their three children. They moved back to the Appleton area in 2000. Dar took an interest in birding at an early grade school age when his father took him trout fishing. He is the coordinator for two Christmas Bird Counts (Appleton and Wisconsin Rapids), and conducts several Breeding Bird Surveys with Cathy as his assistant. His best self-found Wisconsin birds over the years have been a Clark's Nutcracker and Curlew Sandpiper. Wendy started birding in March of 1981 when her microbiology professor invited her on a field trip to Lake Winnebago. He pointed out an America Kestrel and she could NOT believe such a beautiful bird could exist having never noticed one before. A few months later, she attended her first Owen J. Gromme Bird Club meeting and met a whole new group of friends who changed her life forever. One of them was a young bird artist named Tom Schultz. You might say the rest is history. She spent those early years chasing birds obsessively (with Tom) until their sons came along and her schedule took her in other directions. In 2013, after their youngest turned 21, she decided to return to the “flock” and has been having a blast ever since. BIGBY birding is her FAVORITE. Wendy works full time as an ICU nurse at ThedaCare Berlin and part time as a Hospice nurse, for Agnesian Hospice Hope—if you see her at work, you are probably in trouble. Along with birding, she loves to run, bike, and work in her garden. She is the WSO Awards Chair, the WSO BIGBY coordinator, co-founder and secretary of the Green Lake Bird Club, co-coordinator of the Green Lake Bird Festival, and bird surveyor for WBBA I and II. Carl has served as editor of The Badger Birder since May of 2014. (Layout and design are handled by his wife, Barbara Dembski.) Carl also chairs the steering committee for Bird City Wisconsin, is a member of the executive committee on the board of the Western Great Lakes Bird and Bat Observatory and sits on the steering committee for the Wisconsin Breeding Bird Atlas II. Carl joined the WSO Board as Vice President in 2010 and was elected President in 2012. For a decade, he led the Honey Creek Birdathon/Bandathon, a major fund-raiser for WSO. He also serves as program chair for the Riveredge Bird Club, is past president of the Friends of the Cedarburg Bog, and is a member of the American Bird Conservancy, National Audubon Society, The Nature Conservancy, International Crane Foundation, Southeast Wisconsin Invasive Species Consortium, Gathering Waters, Door County and Ozaukee Washington Land Trusts, and Horicon Marsh Bird Club. He retired in 2009 as senior editor for national and international news at the Milwaukee Journal Sentinel. Jennifer grew up in Sheboygan surrounded by parks, wildlife, a marsh named after her family and environmental education… but birding? Birding started with Pale Male, the infamous New York City Red-tailed Hawk. Living a few blocks away from this brash Buteo jamaicensis for over 16 years she quickly became a bird enthusiast. For years, with passion and love, she followed his nests, relationships, and grand talent of ridding the New York streets of pigeons and rats. A sudden personal loss brought her back to Wisconsin after being away for decades. Attending a Schlitz Audubon Nature Center Gala, luck had it that she had the winning bid for a private raptor workshop which launched her into a new chapter of the natural world and birding. She recently began volunteering for the Wisconsin Humane Society Wildlife Rehab Center in the avian section and monitored 5 downtown Milwaukee high-rises for the WIngs bird collision monitoring program during migration months. Recently she has taken over co-hosting the monthly bird club at the center and found it invigorating to refresh the bird club and increase their members. There are many more tasks that she has taken on that are bird and bird conservation oriented and she loves talking about them, so just ask her! Outside of these activities, she can be found spending time with friends in nature, hiking, and exploring culinary adventures. She loves to urban farm and cook! Becoming a vegetarian and being more accountable to sustainability has also been a huge priority. The contents of my purse may include: tagging material, raptor glove, birding notes, hiking maps, baby food jars (for up close insect observations), and a huge lighted magnifying glass. Kari has always loved being outdoors and developed a love for nature at an early age during family camping trips to Wisconsin’s Northwoods. Growing up in Two Rivers, Wisconsin and then moving to Green Bay, she likes to say that she has never strayed too far from Lake Michigan. Kari attended the University of Wisconsin – Green Bay earning her BS in biology in 2009 and MS in environmental science and policy in 2012. Since then she has worked for the non-profit organization The Nature Conservancy (TNC) in their Sturgeon Bay office, where she manages approximately 5,000 acres of nature preserves owned by TNC on the Door Peninsula. Kari was first mesmerized by a bird when a barred owl scared her in the middle of the night while she was conducting wolf howling surveys for the U.S. Forest Service in the Chequamegon-Nicolet National Forest. After taking an ornithology class in 2010 she has been hooked, planning trips both within Wisconsin and elsewhere around the birds. Kari also volunteers doing bird surveys for several organizations and serves as the Treasurer for the Northeastern Wisconsin Audubon Society. When not birding, she enjoys spending time with her husband Tyler and their dog Brewer, running, hiking the Ice Age Trail, reading, cross-stitching, playing darts and sampling craft beers. Tom has worked as an artist/illustrator for over 35 years, and has had his work published in the National Geographic's Field Guide to the Birds of North America, Peterson's A Field Guide to Warblers of North America, and various other publications. Tom grew up in Fond du Lac, and received his BS in Wildlife Ecology from the University of Wisconsin-Madison. Tom joined the WSO Board as Field Trips Coordinator, and has also served as Vice President and President. Tom is an active birder with a strong interest in field identification – which is an outgrowth of his bird illustration work. He has lived in the Green Lake area with his wife, Wendy, since 1983. Jeff grew up in Milledgeville, IL, and then attended Coe College in Cedar Rapids, IA where he earned a degree in Mathematics and Physical Education in 1979. Jeff has taught high school mathematics at Campbellsport since 1982 and has also been part of their IT staff. Jeff began birding with his elder brother Jim during winter break of 1977. The brothers three (Jim, Jeff, Scott) have collectively and/or individually spent countless hours in the field padding lists or doing various bird counts or surveys, including Christmas Bird Counts, May Days, Big Days, Illinois Spring Bird Counts, Breeding Bird Surveys, and the Western Great Lakes Owl Survey. 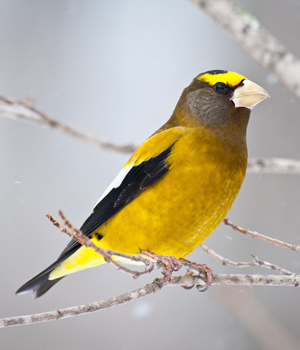 He also served a regional coordinator for the first Wisconsin Breeding Bird Atlas. Jeff joined WSO in 1983, became Field Trip co-chair with Tom Schultz in 1987, served as Vice President for one year in 2003 and then was President from 2004-06. Jeff lives with his wife Jeanette just outside of Campbellsport, and they have two children, Tamara Ninnemann (25) and Tyson (22). Nancy has a long history of volunteerism in Wisconsin, and specifically in the Green Bay area. She has volunteered with the Green Bay Chamber's "Leadership Green Bay" program for 12 years, where she has facilitated "Environment Day." Nancy served on the Greater Green Bay Sustainable Task Force for five years, and participated on the "Local Food and Health" and "Environment and Vibrancy" subcommittees. Nancy has also been involved with a grassroots project called the Pollinator Corridor. In 2010, Nancy was instrumental in getting the city of Green Bay recognized as one of the first Bird Cities in Wisconsin, and has been at the helm ever since. As part of Bird City, Nancy also serves as Co-Chair of the statewide Chimney Swift Working Group. In November of 2011, Nancy received the, Conservation of Natural Resources Award from the Mayor's Beautification Committee. In May of 2012, she was presented with the Robert Sanderson Award from the Brown County Izaak Walton League chapter for her bird conservation efforts. She is pleased to be on the WSO Board in the Historian position, and looks forward to helping create positive change. Levi earned an MS in Zoology from the University of Wisconsin-Madison with a specialization in ornithology and got hooked on Christmas Bird Counts and Madison Audubon Society (MAS) field trips. During 1979-1980, Levi taught Ornithology, along with general and applied ecology courses at Augustana College in Rock Island, IL. In 1984 Levi earned a law degree from the University of Wisconsin Law School, with an emphasis on environmental law. While in law school, summers were spent as an interpretive naturalist in Yellowstone National Park. Upon graduation he worked as an assistant general counsel in Region V, EPA in Chicago, but finished his career at the Department of Agriculture Farm Service Agency in Madison. Levi's goal as Honey Creek Committee Chair is to restore and preserve the site's diverse bird habitats. Levi has volunteered as a naturalist for the UW Arboretum for the past 15 years, and served on the board of MAS for 20 years. Levi has led trips to Costa Rica and Isle Royale for MAS and has participated on several Central American birding trips, including WSO and Natural Resources Foundation trips. Michael John lives in his hometown of Madison. He studied environmental studies and ornithology at the University of Wisconsin, with an early focus on marsh birds and shorebirds. Michael John retired as a utility policy analyst at the state Public Service Commission, where he occasionally got to use his birding background when evaluating environmental consequences of major construction proposals. Michael John joined the WSO Board in 2010, serving as Chairs of the Scholarships and Grants Committee and Conservation Committee. He recently completed two-year terms each as WSO Vice President and President. Michael John considers himself mostly a recreational birder, which helps him in his quest to "wander about and explore the countryside." Quentin has been birding about 15 years. He is a member of the Madison Audubon Society and Ned Hollister Bird Club out of Beloit, and enjoys leading field trips for both organizations. He also recently accepted the position of WSO Records Committee Chair. Growing up on a farm in southern Wisconsin amongst a family of hunters and fishermen, Quentin was exposed to nature on a daily basis. In addition to bird watching, another one of his passions is coaching. He has coached high school Track and Field each spring and Cross Country each fall for 25 years. Professionally he has worked in the information technology field for more than 20 years. Quentin lives in Evansville with his exceptionally patient wife, Ann, and two teenagers, Geoff and Zoe. Aaron started birding when he was 10 years old and is still going strong. He participates in big days, breeding bird surveys, and particularly enjoys leading nature hikes when time permits. He earned his BS in Environmental Science with minors in chemistry and geography from Mansfield University in Mansfield, PA in 2001. In 2005, he acquired an MS in Environmental Science with a concentration in Applied Ecology from the School of Public and Environmental Affairs (SPEA) at Indiana University in Bloomington. Aaron worked as an ecologist at the Strawberry Plains Audubon Center in Holly Springs, Mississippi for two years where he led daily interpretive walks. He currently works as an Environmental Analyst and Review Specialist at the Public Service Commission of Wisconsin. Besides birdwatching, he enjoys fishing and nature study.